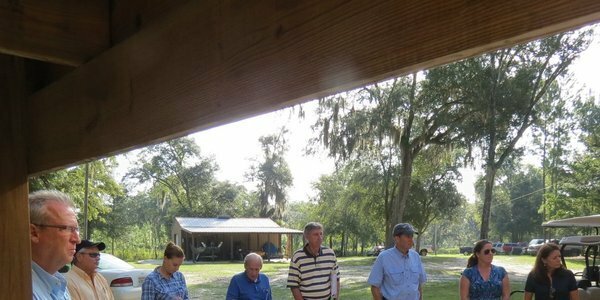 Sabal Trail invites the public to an Open House about a Withlacoochee Alternative that would avoid the Withlacoochee River in Hamilton County, Florida. 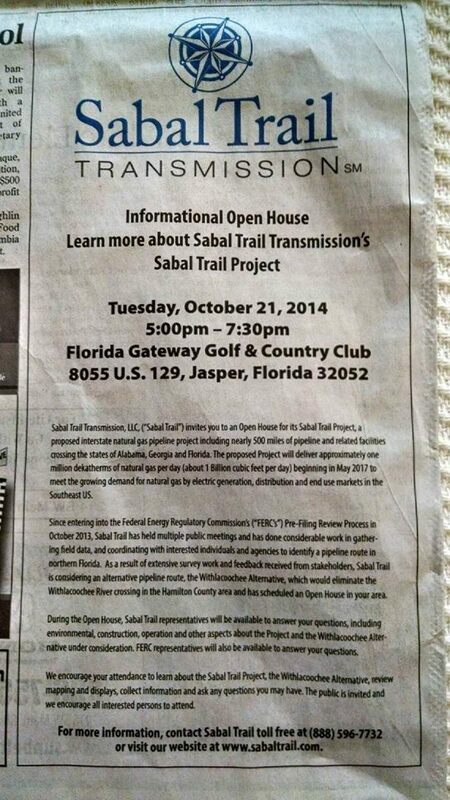 Update 2014-10-15: SpectraBusters facebook event and Sabal Trail new route alternatives filing. Maybe you’d like to ask them how about avoiding the Withlacoochee River in Lowndes County, Georgia? Or about those three already-authorized LNG export operations right where that pipeline leads. How about why all seven proposed paths would cross the Suwannee River into Suwannee County, Florida? How about asking them not to cross the Santa Fe River, the Suwannee River, the Flint, or the Chattahoochee? Hm, that might mean there’s no path for their pipeline…. 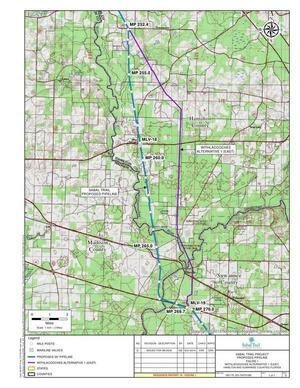 As a result of extensive survey work and feedback received from stakeholders, Sabal Trail is considering an alternative pipeline route, the Withlacoochee Alternative, which would eliminate the Withlacoochee River crossing in the Hamilton County area and has scheduled an Open House in your area. 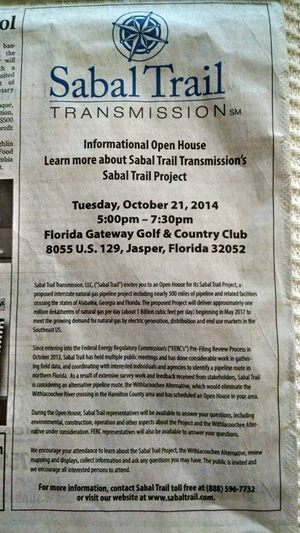 During the Open House, Sabal Trail representatives will be available to answer your questions, including environmental, construction, operation and other aspects about the Project and the Withlacoochee Alternative under consideration. FERC representatives will also be available to answer your questions. Apparently that’s what Sabal Trail called Withlacoochee Alternative 1 (East) in its 15 September 2014 filing responding to FERC’s directive to find some alternatives. We encourage your attendance to learn about the Sabal Trail Project, the Withlacoochee Alternative, review mapping and displays, collect information and ask any questions you may have. The public is invited and we encourage all interested persons to attend. So let’s take them up on their invitation! Found in a newspaper today; I’m not sure which one; I’m not sure by whom.